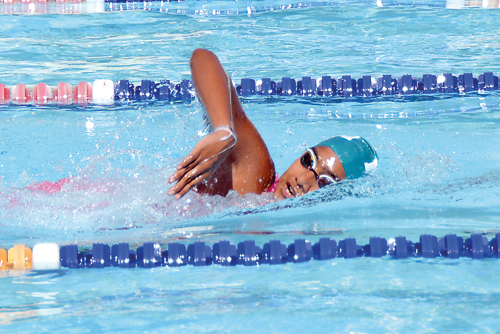 The 4-day National Short Course Swimming Championship 2019 concluded at the Isipathana College Swimming Pool complex last Tuesday with 35 new individual and relay records being established. Hiruki De Silva of Gateway College, Dehiwala, shattered 5 records in the Girls’ Under-15 category. Hiruki started the the meet with a bang by setting up 2 records on Day 1. Apart from Hiruki De Silva the other outstanding swimmer was Peterite Akalanka Peiris who lowered the record held by swimming sensation Matthew Abeysinghe, in the 50m Backstroke. Peiris, with a time of 25.50 secs, improving on Abeysinghe’s 25.57 secs. Peiris also went on to establish a record in the Boys’ 100m Backstroke with a time of 54.91secs, as against the old mark of 55.59secs. In the Overall Girls’ U-15 events Sirimavo Bandaranaike Balika Vidyalaya with 167 points finished at the top, while Lyceum Wattala with 129 points and Visakha Vidyalaya with 109 points, took 2nd and 3rd spots, respectively. Ananda College, Colombo, with 149 points led in the U-15 Boys’ category, closely followed by Lyceum Nugegoda with 127 points, with St. Joseph’s College, Colombo, 3rd with 117 points. In the Overall Girls’ events Visakha Vidyalaya with a massive 298.50 points were way ahead of Mahamaya Girls School, Kandy 157.5 points and Sirimavo Bandaranaike BV 151 points. Ananda College, Colombo led the Overall Boys’ events with 221.5 points, while Killerwhale Aquatic Club 203 points and St. Joseph’s College, Colombo 134 points finished 2nd and 3rd respectively. Girls U-15: 200m Individual Medley- 2:34.86 min, 100m Freestyle- 1:02.79 min., 400m Freestyle- 4:56.12 min., 800m Freestyle- 10:25.20 min., 200m Freestyle- 2:18.2 min. Girls U-15: 200m Individual Medley- 2:36.27 min., 100m Butterfly-1:09.79 min., 50m Butterfly- 30.95 secs, 200m Butterfly- 2:41.44 min. Boys 50m Backstroke- 25.5 secs., 100m Backstroke-54.91secs. (St. Bridget’s Colombo): – Girls U-15: 200m Backstroke- 2:30.68 min. Dilrukshi Perera (Hillwood Kandy): Girls 50m Butterfly- 29.45 secs. 100m Backstroke- 1:08.55 min., 200m Backstroke-2:36.49 min., 50m Backstroke- 31.59 secs. Vanuja Kannangara (St. Joseph’s Colombo): U-15 Boys 200m Backstroke- 2:25.92 min. Dasindu Geesath Perera (Ananda Colombo): Boys U-15 Breaststroke- 1:12.59 min. Oneli Yahampath (Lyceum Intl’, Nugegoda): Girls U-15 200m Butterfly- 2:40.01 min. Yash Biran Peiris (Asian Intl’ School): Boys U-15 1500m Freestyle- 18:09.95 min. Senal Pathirana (Ananda College): Boys U-15 1500m Freestyle- 18:45.60 min. Taha Anverally (EMS): Boys U-15 1500m Freestyle- 18.46.4 mi. Sandev Senarathne (Ananda College): Boys 200m Butterfly- 2:07.4 min. Visakha Vidyalaya, Colombo (3): Girls 400m Medley- 4:40.08 min., 400m Freestyle- 4:12.14 min., Girls 200m Medley- 2:04.86 min. Lyceum Intl’ School, Nugegoda (3): Boys U-15 400m Freestyle- 4:04.74 min., 200m Freestyle-1:50.36 min, Boys 200m Medley- 2:06.06 min. Lyceum Intl’ School, Wattala: Girls U-15 200m Medley- 2:17.28 min. Sirimavo Bandaranaike BV: Girls U-15 200m Medley- 2:18.41 min.